WILMINGTON (Oct. 3, 2018) – As a way to engage more Delawareans suffering from substance use disorder in treatment, while also meeting their accompanying needs for housing, employment, education and other wraparound services, the Department of Health and Social Services (DHSS) today launched its START Initiative with a press conference and a daylong forum for stakeholders. With the START Initiative, DHSS’ Division of Substance Use and Mental Health (DSAMH) will increase access to care and treatment for individuals living with substance use disorder by fostering system-wide improvement based on a framework that measures client outcomes. Last week, DSAMH launched a new online treatment referral system called Delaware Treatment and Referral Network (DTRN) that allows Delaware health care providers seeking substance use disorder treatment or mental health services for their patients to make an online referral with one of 24 organizations included in the first phase. Additional addiction and mental health treatment providers will be included in subsequent phases. In its first year, the Substance Use Treatment and Recovery Transformation (START) Initiative is expected to engage and treat more than 900 new clients using certified recovery peers connected to emergency departments, primary care, urgent care, EMS, police officers and families as the gateway. 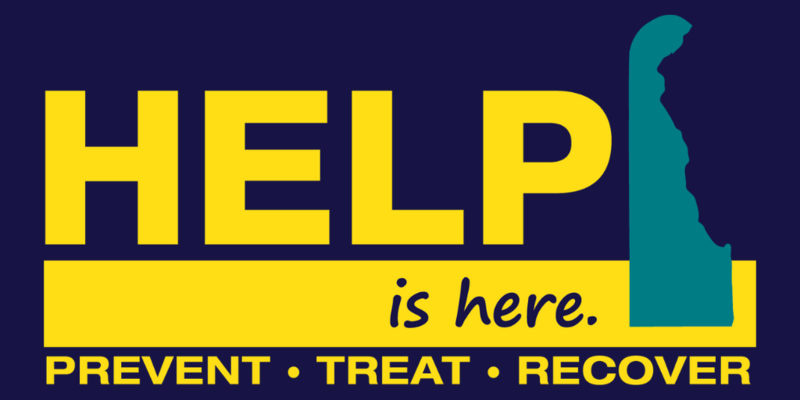 The peers will assist individuals suffering from substance use disorder as they navigate their way through both the treatment and social services systems, helping meet their needs for housing, transportation, employment, social services, legal or financial counseling, and other behavioral health or medical care. 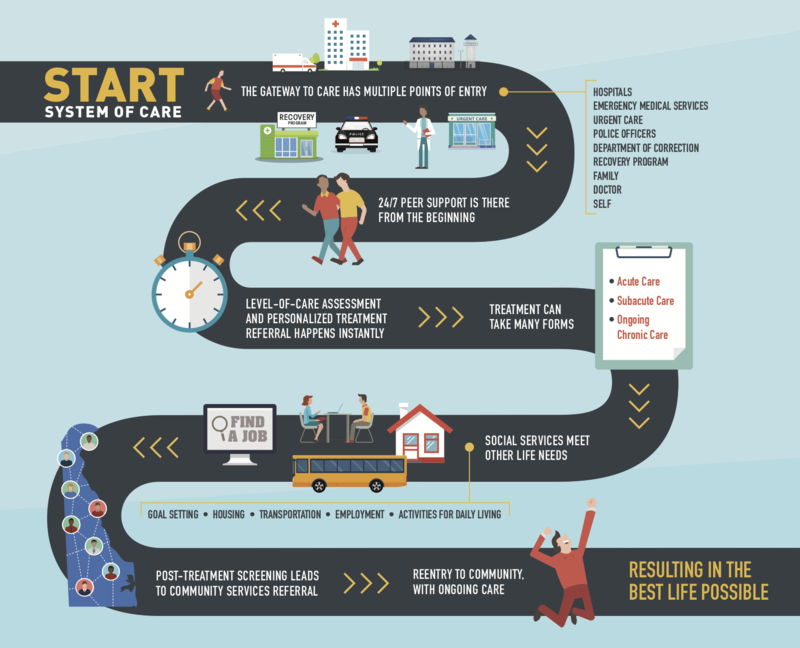 The START Initiative builds on the best evidence-based treatment and wraparound services needed for long-term recovery, but also offers technical supports to providers in the community to evaluate for quality and standards. As part of the START Initiative, DSAMH awarded contracts to Brandywine Counseling & Community Services and Connections Community Support Programs as Level 4 providers, the highest level in Delaware for SUD treatment. That means the two organizations can provide clients with every level of treatments and services, including all three FDA-approved forms of medication-assisted treatment. Later this fall, DSAMH expects to add more treatment providers at each level of care. DSAMH also awarded a peer recovery specialist contract to Recovery Innovations International to help navigate individuals into treatment and to maintain their connection to that care. “To reduce the toll that addiction is taking across our state, we must engage people suffering from substance use disorder in treatment available today. We know what works, now we need more patients with access to medication-assisted treatment combined with behavioral counseling and social supports,” said DHSS Secretary Dr. Kara Odom Walker, a board-certified family physician. $990,000 for SUD assessment and referral to treatment of people who have overdosed or are suffering from addiction and have been brought to emergency rooms. $328,500 for 20 additional sober living beds. $100,000 for naloxone – the prescription medication that can reverse the effects of opioid overdoses – for first responders statewide. In June, Governor Carney signed a budget passed by the General Assembly that included $3 million in funding for the Behavioral Health Consortium, more than half of which is allocated to increase treatment and recovery services, and $2 million for improvements to the Delaware Health Information Network (DHIN) that will include behavioral health claims. The START Initiative received a boost of $2 million in federal funding through the State Targeted Response to the Opioid Crisis grant, made possible through the signing of the 21st Century Cures Act. Through the federal grant from the U.S. Substance Abuse and Mental Health Services Administration, Delaware received $2 million per year for two years. START also will receive funding from Medicaid reimbursements and state general funds. The new system of care ensures 24/7 support through certified peer recovery specialists who will meet with individuals suffering from addiction wherever they connect with the system – a hospital emergency department, a doctor’s office, EMS transport, a police encounter or through a family or self-referral. Once individuals are in treatment, peers will help clients to navigate and stay engaged in their own care. Peers also will engage family members as appropriate to discuss treatment questions, issues, needs, options and preferences. In addition, peers will connect pregnant women to existing programs that provide home visiting and prenatal care. Under the START Initiative, providers will be required to track and report aggregate outcomes, including intake assessments, clinical progress and receipt of supplementary services. The first step in understanding that level of accountability came with today’s forum for treatment partners in which they learned about evidence-based practices and the need to improve the coordination of care. That coordination will be enhanced by an Overdose System of Care, which will establish EMS and emergency department protocols to improve acute response, initiate medication-assisted treatment to manage withdrawal, and rapidly engage individuals with treatment. In September, Governor Carney signed legislation making Delaware the first state in the nation to have an Overdose System of Care. In 2017, emergency medical service responders administered 2,711 doses of naloxone – a prescription medication that can reverse the effects of an opioid overdose – to 1,905 patients in Delaware. Both totals were up more than 16 percent from the 2016 totals. Additionally, law enforcement officers administered naloxone to 149 people in 2017. Deaths from overdoses also increased in 2017, with 345 people dying in Delaware, according to the Division of Forensic Science (DFS). That total was up about 12 percent from 2016. Through Oct. 1 of this year, 218 people have died from suspected overdoses in Delaware, including a record monthly total of 39 lives lost in August, according to DFS. If you or a loved one is struggling with addiction in Delaware, call DHSS’ 24/7 Crisis Hotline to be connected to treatment and recovery options. In New Castle County, call 1-800-652-2929. Or in Kent and Sussex counties, call 1-800-345-6785. To search online for treatment and recovery services in Delaware or nearby states, visit www.HelpIsHereDE.com.